FourStory and Down & Out Books proudly announce the release of a graphic novel written by Gary Phillips and Tony Chavira and illustrated by Manoel Magalhaes. BEAT L.A., divided between the perspectives of Bicycle Cop Dave and Brand & Reese, offers such fare as a crack smoking lawyer, a one-armed crazed prophet, a hidden homeless enclave, a musclebound woman enforcer, a preacher with more than the Gospel on his mind, the devious Genghis Rabbit, mystic gangbangers, cartel funded property shenanigans, pandering politicians, and some big time development hanky-panky. Bonus material includes “A to Z,” a prose short story written especially for this edition that bridges the Bicycle Cop Dave and Brand & Reese stories, as well as an interview with Beat’s two writers, Gary Phillips and Tony Chavira. 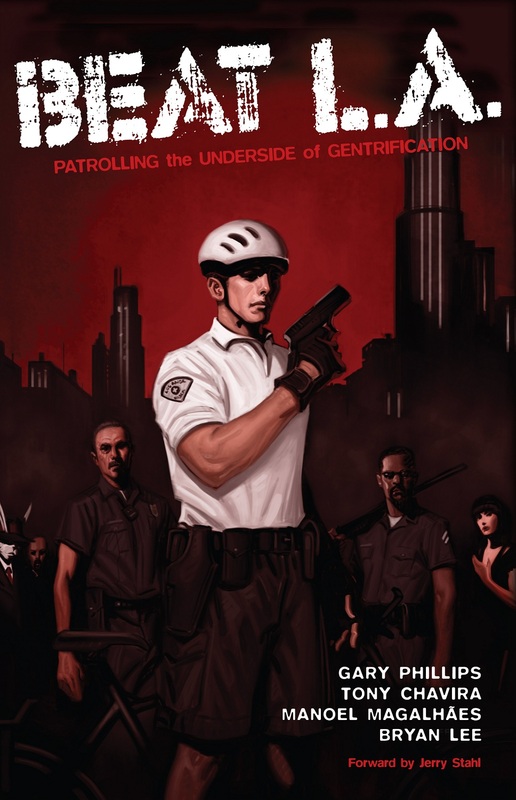 Crime novelist Gary Phillips has written comics for DC/Vertigo, Dark Horse, Oni, Boom Studios! and Moonstone. Tony Chavira has been published in the Sustainable Cities Collective, Urban Land Magazine and National Review Transit Experts Blog, and writes the comic Tuna Carpaccio P.I. You can purchase the GN HERE.